This dumb-cop yuk-fest is not funny; it's just scraping the bottom of the entertainment barrel. Steve Carr's comedy pretends to care, but it's just another sophomoric exercise in humiliating the dumb fat guy with the laughable job. 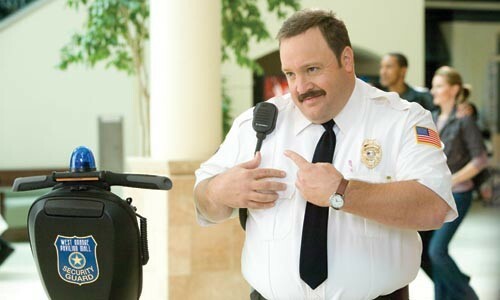 Kevin James portrays a mall security guard named Paul Blart (rhymes with "fart"). Blart should be sympathetic, but he's set up as whiny, needy and dangerous self-deluded. When a crew of bad guys - who inexplicably use bikes, skateboards and parkour techniques to simply steal credit-card codes - invades the mall on Black Friday, Blart, who has clearly learned most of his skills from the Home Alone series, saves the day, the pretty girl and the holiday shopping season.